How do teachers use the data on student standards mastery, performance and risk, and growth that is generated and available in Galileo? 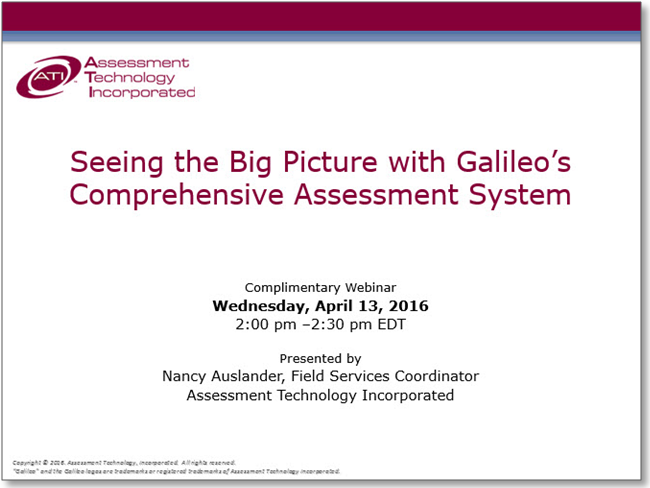 What tools does Galileo offer to incorporate student performance data into educator evaluation or measures of instructional effectiveness? If you missed the webinar or would like to forward it on to a co-worker, the link is provided below. 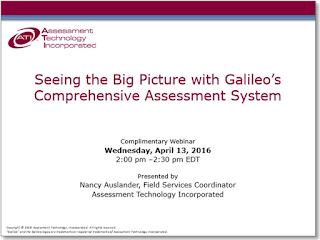 ATI webinars offer exciting insight into Galileo including the technology that has enabled us to build over 9,000 unique assessments containing nineteen different types of technology enhanced items. The webinars are complimentary and are recorded for later viewing. The recordings can be accessed from the ATI website along with many other helpful videos, Dialogs, and webisodes. View the full schedule of the complimentary webinars demonstrating how thoroughly and flexibly Galileo technology supports educators. Register today.